North of Fray Bentos, after passing international bridge. Situated on the left bank of the Uruguay river, 5 kms North, upriver from the international bridge Gral San Martin – Fray Bentos/Puerto Unzué (Argentina), with airdraft limitation of 45 meters; reported clearance 40 m.
The pier is made of reinforced concrete 192 meters long and 65 meters wide, where Panama and post-panamax Vessel can operate. Two mooring dolphins are placed at each end of pier, which has fenders all along. 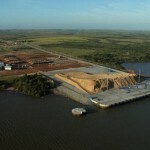 The port has a yard of 10.7 hectares for storing logs and chips. Depth alongside is 9,14 m to datum. 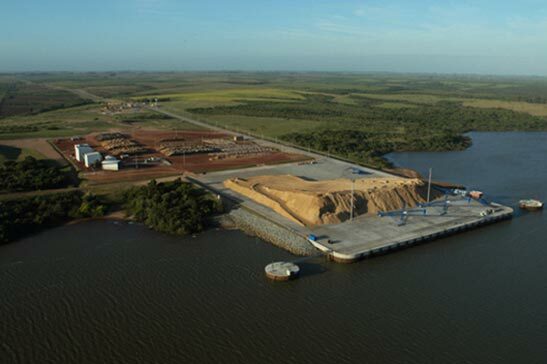 Vessel´s sailing draft is limited equal as Fray Bentos port, due to the Four passes on the river, south of Fray Bentos, which has mínimum dephts of about 5,80 m to datum. Safe draft for Navigation purposes is usually 6,40m. It is compulsory, same as Fray Bentos. Only MGO/DO arriving by trucks from Paysandú or Montevideo.